I thought I would do an occasional post about some of the mysteries in Cornwall, where I live. 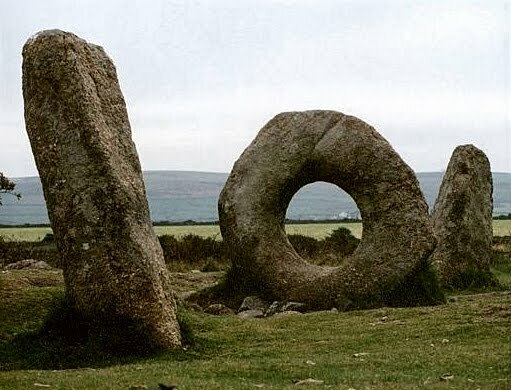 I'm starting off with Men-an-Tol, which is sometimes referred to as the Crick Stone or the Devil's Eye. Men-an-Tol means, in the Cornish language, 'stone and hole' which very much describes what it is, as can be seen from the photo above. Men-an-Tor is said to heal many ills. It was famous in olden times for curing scrofula (lymphatic tuberculosis) and rickets in children. The children were passed naked three times (or some say nine times) through the hole to effect the cure. Adults can gain relief from bad backs by crawling through the opening nine times. Radiation levels around the inside edges of the hole are said to be nearly twice that found in the background environment, maybe this has some significance. Rituals may also have once been taken place here with the hole aligning to other ancient sites or as a window into other worlds or dimensions. 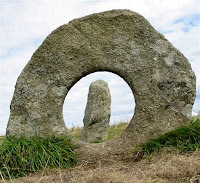 It has also been suggested that passing through the stone could have signified a ritual re-birthing process, perhaps performed as a rite of passage or to ensure fertility. Whatever mysteries the stones hold it is a magical place, perhaps even a psychic powerhouse. never heard of these stones b4. must have a look when next in cornwall. i often go that way. I've never heard of these either. This is fascinating! I don't think the stones are particularly well known. Maybe because they don't have the dramatic appearance of, say, Stonehenge. Nevertheless there is something magical about them. I read a book many, many years ago about similar stones that said there was a belief that passing an injured person through the stone would heal them. It was a long time ago and may have been a different set of stones, but I thought I'd pass that theory on.